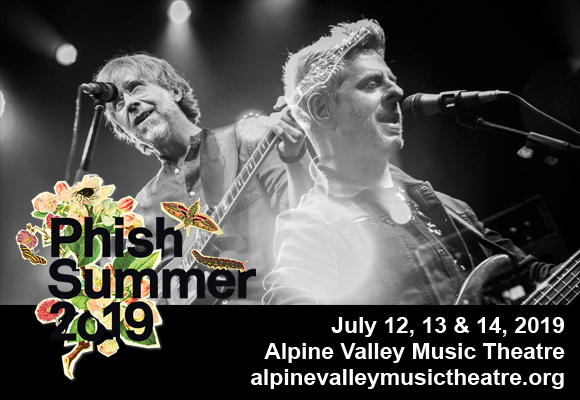 It's the final night of a three-date Phish extravaganza as Trey and co take to the Alpine Valley Music Theatre stage on Sunday 14th July 2019 for an unmissable closing set! The iconic group have managed to retain a loyal and dynamic fanbase over the years, keeping thousands of people coming back year after year with their fun and innovative performances! Expect classic hits taken to the next level by these legendary entertainers! World-famous American rock band Phish formed at the University of Vermont in 1983. With a devoted following of fans similar to that of the Grateful Dead, Phish are well known for their spontaneous and collaborative live sets and extensive touring. Over the years, the band has released thirteen studio albums and has sold over eight million albums and DVDs in the United States. The group's current line-up of "Trey, Page, Mike, and Fish" (lead vocalist and guitarist Trey Anastasio, bassist Mike Gordon, keyborad player Page McConnell and drummer John Fishman) has performed together on-and-off for over thirty years. The band's genre-defying music, which touches upon a myriad of influences from reggae to straight up rock to free-form jazz, always retains an undercurrent of fun, bringing party vibes to every performance.